The Mark H. McCormack Foundation has entered into partnership agreements with universities, libraries and funded independent initiatives to support efforts to better understand the enduring innovations of the modern sports marketing industry as well as to foster learning among the next generation of its leaders. The Isenberg School of Management at The University of Massachusetts, Amherst, renamed their sports management program after Mark H. McCormack and collaborates with the family on a number of legacy initiatives. The McCormack Trophy is awarded annually to the male professional golfer who has spent the most weeks in the top spot on the World Golf Ranking, recognizing McCormack's role in conceiving and managing the development of the official ranking for the sport. In partnership with Livestream, the Sports Business Education Network (SBEN), provides a free platform for any conference or educational event to share their message more broadly. Contact: Beth Grupsmith for details on event coverage. The Mark H. McCormack Papers were gifted to the University of Massachusetts Amherst in 2010 and provide an inside look at the last 50 years of the business of professional sport. The collection contains correspondence, memos, drafts, reports, contracts, research files, marketing materials, and memorabilia. The Mark H. McCormack Center Sport Research and Education supports and funds new research and education initiatives for both academics and industry practitioners. 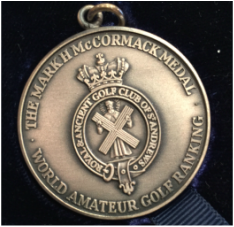 The Mark H McCormack Medal is awarded annually to the male and female player ranked number one in the World Amateur Golf Ranking. This initiative was developed in partnership with The Royal & Ancient Golf Club and the United States Golf Association.